By now you’ve probably heard of the “Cloud”. You also probably know that the cloud is more than just a place where data rides on fluffy bits in the proverbial sky we call the Internet. But can you have your own cloud? 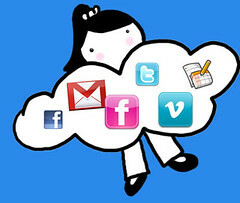 And how can teachers use their own cloud to help them in their classroom? Believe it or not, you can in fact have your own “cloud” on your own computer by using something called a “Virtual Computer”. Using some special software you can create a computer within your computer; yeah really. Oh yeah, and you can do it for free. Have you ever wanted to install some software to play around and then get rid of it when you’re done. Well, with a virtual computer, you can. If you install software to your virtual computer and it starts spamming you with pop-ups and less than savory material, just delete your virtual computer and start a new one; no harm done. Using a feature called “Snapshots”, a virtual computer that lets you revert it back to a previous state. Think of it like an “undo” button for an entire computer. Mess up on installing an app? No problem, revert to the previous snapshot with a click. Virtual Computers can have settings that reset it back to a known default every time its booted. Let your students play on your or other School resources and if they mess it up, just reboot and it will be like nothing happened. You get to control how much resources are allocated. Want to allow kids to play games? Cool, allocate the resources to do that. Want to make it so they can’t? Easy, turn down the resources and Candy Crush will look like just like how you remember Pacman from 1983. Are you running Windows 8 and wish you could run that really old Windows XP program that you think would be perfect for your kids to learn something? With Virtual Computing, you can! You can run a Windows XP Virtual Machine right inside Windows 8. Is that old website that still provides good educational value forcing you to use IE 6 but all you have is IE11? Again no problem, you can run IE6 in the Virtual Machine and IE11 on your main computer seamlessly. Even better is that the VM has absolutely no harm to your main computer! So Virtual Computing has many benefits for the educator and I hope you can see the potential. So how do you get started? I recommend a program called VirtualBox. It’s free, and allows you to create as many virtual computers as your own hard drive will hold. This same program works on both Mac and PC, and did I mention it was free? Get VirtualBox here. It installs just like any other program. Basically just accept the defaults; there’s not much to change. If you have an old copy of Windows XP or Vista, or whatever laying around you can make it live again! If you have Windows 7 or Windows 8 Professional or Ultimate you can actually install another copy as a virtual computer by using the serial number on the side of your computer. If however you don’t have any that that’s ok too, Microsoft provides copies of Windows for free (really). Go here to download different images of Windows for testing purposes. Just be sure to download VirtualBox under “Select your OS” so you can get the right images. You can download Windows 7 or XP with any version of Internet Explorer that you’d like. Microsoft provides detailed instructions from the Modern.ie website; but the long and short of it is that once you have all the parts you double-click the EXE on PCs or open the SFX in “The Unarchiver” on Mac to turn the parts into a VirtualBox OVA file. This process can take a few minutes so be patient. Now that you have your OVA just double-click it and VirtualBox will import it automatically. You don’t need to change any settings unless you know you want to; the defaults are perfectly good to get started. That’s it. So a few downloads and a couple of double-clicks and you’ll have a functioning computer inside your computer. Pretty cool, eh? Ok so technically no. If you downloaded something from Modern.ie these are evaluation versions for 120 days. They are meant for debugging and testing. But in my opinion those are fancy words for “playing with stuff” which is exactly what you want to do as an educator. Get in, play with things, let your kids experiment; that’s what constructivism is all about isn’t it? After 120 days – shhhhh, don’t tell Microsoft this – but you can just delete the VM and install it again; you’ll have another 120 days. If you want a permanent virtual machine, and you can since you can install as many VMs as your computer’s hard drive can hold, you can always buy a copy of Windows and install it into Virtual Box. As I mentioned above, if you have Windows Professional or Ultimate you can do this already at no additional charge! Can I have a virtual computer of a Mac? Yes! There are some caveats. You must be running OS X 10.9 (and why wouldn’t you be, its free). You must also be on a Mac to start with. Sorry Windows users, no installing OS X on your Windows PC (at least legally); although those of us on Macs can indeed enjoy best of both worlds. The final caveat is you’re going to need to be willing to get your hands dirty so to speak. This is not a drag and drop process. It is legal however which is the most important point. Apple has modified their license agreement with 10.9 to allow you to install the client up to two more times which means VMs are now allowed. If you want to take the plunge in running Mavericks on Mavericks, read this comprehensive documentation. So what have we learned? First, I hope you see some value in using Virtual Computers either for yourself or your classroom. Second, while this is a very very simplified example, think of hundreds of these virtual computers working together across the world to make up one gigantic mega-computer and you’ve got “the cloud”. Finally, I hope you have taken the opportunity to install your very first virtual computer. Please share in the comments how you’re using this in your classrooms or just for yourself.